So, now that I know Mary and Keith are OK and I have gotten a little sleep; life goes on. My heart goes out to all those affected by this terrible tragedy. And today, I got an e-mail from my wonderful friend and neighbor when we lived in Deltaville. Her beloved golden retriever died. My heart goes out to her, as I well know how awful this time is for her. 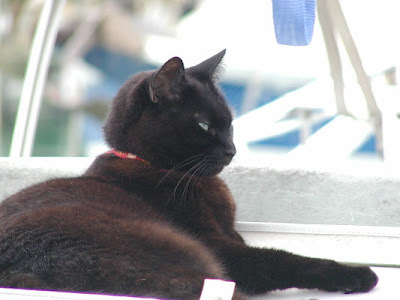 We just lost our 2 kitty companions in the past year.These cats were 16 years old and had traveled the islands with us on our boat. I was devastated when they died... and within 8 months of each other. I think of them every day, and many days I still cry. My heart goes out to Susie and the pain she is now enduring. And, though I miss my Sidney & Ira every day( pictured above), These 2 new little babies, my precious ragdolls Chloe and Harry brighten my days and help to ease the pain of the loss of Sid & Ira. What's not to love here?! It's so sad to see the photos of Sidney and Ira but the new babies are sweet. I love those pictures...you did a great job taking them, it almost like they were posing for you! Has my mom made quilt for the new kitties?